A couple of years ago we covered the Library of Congress’ newspaper digitisation project, Chronicling America, alongside a number of other digitised newspaper collections. The resource allows researchers to search and view a million newspaper pages for free from 1880-1922, covering the following American states: Arizona, California, District of Columbia, Florida, Hawaii, Kentucky, Minnesota, Missouri, Nebraska, New York, Ohio, Pennsylvania, Texas, Utah, Virginia and Washington. The Chronicling America team is producing a number of subject guides with sample articles to assist researchers. Subjects selected so far include Baseball’s Modern World Series, Ellis Island, Jack Johnson, Patent Medicines, the Russo-Japanese War, and Early Cinema. Topics in Chronicling America – Early Cinema provides a list of key dates, a list of helpful search terms (Moving Pictures, Motion Pictures, Muybridge, Chronophotographic, Kodak, Kinetograph, Kinetoscope, Mutoscope, Cinematographe, Vitascope, Thomas Edison, Nickelodeon), and sixteen sample articles, from “All the Gaits of Horses” [Shown in Moving Pictures by Zoopraxiscope], New York Sun (New York, NY), 18 November 1882, to “Colored Moving Pictures”, The Sun (New York, NY), 21 March 1909 (the majority of the newspapers selected for Chronicling America don’t go beyond 1910). My thanks to regular Bioscopist David Pierce for bringing this to my attention. 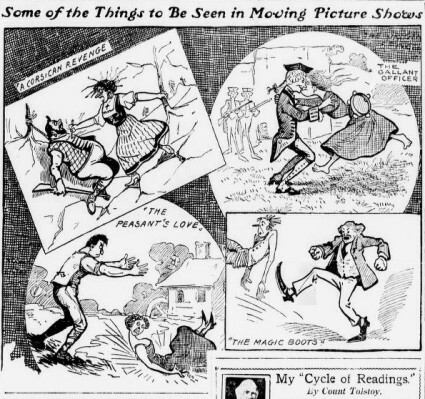 An updated survey of digitised newspaper resources handy for the study of early film is long overdue. I’ll set to work on it.